Rust-Oleum, DAP and Varathane parent company RPM International Inc. reported sales were up 4 percent and net income grew 20 percent for its fourth quarter, while sales grew 5 percent and net income increased 48 percent for its fiscal year ending May 31. All in all its fourth quarter and fiscal year 2016 performance resulted in record sales, net income and diluted earnings per share, the Medina, OH-based holding company announced Thursday (July 28). "RPM turned in a solid performance for our fourth quarter, especially in light of the headwinds posed by the continuing strong U.S. dollar, slow growth in many international regions and a worldwide recession in the energy and heavy manufacturing segments of the economy," said Frank C. Sullivan, RPM chairman and chief executive officer. Fourth-quarter net sales increased 3.9 percent to $1.43 billion, while net income for the period jumped 9.5 percent to $152.9 million from the fourth quarter of fiscal 2015. 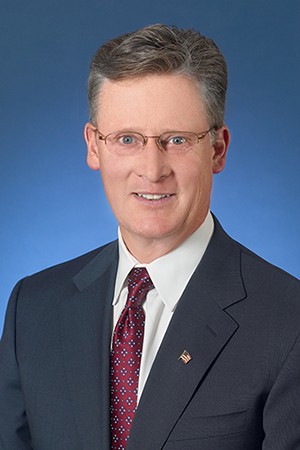 RPM Chairman and CEO Frank Sullivan noted the company achieved "solid performance" in its fourth quarter despite negative currency effects, slow growth in international regions and a worldwide recession in energy and heavy manufacturing segments. Diluted earnings per share were $1.13, up 20.2 percent from the prior year. Consolidated earnings before interest and taxes (EBIT) improved 7.9 percent to $220.4 million from a year ago. For the fiscal year, cash from operations soared 43.7 percent to $474.7 million, up from fiscal 2015. Total debt at the end of fiscal 2016 was $1.65 billion, compared to $1.66 billion at the end of fiscal 2015. RPM's net (of cash) debt-to-total capitalization ratio was 50.2 percent, compared to 53.4 percent at May 31, 2015. "Our total liquidity of $1.1 billion, including $265.2 million in cash and long-term committed available credit, compares to $963.8 million a year ago,” Sullivan said, adding that the company has sufficient resources to fund a growing cash dividend, invest in its businesses and pursue a robust acquisition program. Consolidated full-year net sales for fiscal 2016 went up 4.8 percent to $4.81 billion from fiscal 2015. Net income rocketed 48.1 percent to $354.7 million from the previous fiscal year’s report. Diluted earnings per share of $2.63 also jumped up 47.8 percent from $1.78 a year ago. 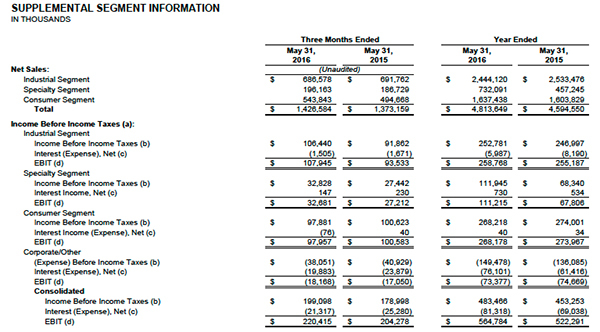 Consolidated EBIT was up 8.1 percent to $564.8 million. Fiscal 2015 net income included an adjustment of $83.5 million in the third quarter for a non-cash, net charge for a tax accrual. Fiscal 2016 net income increased 9.8 percent compared to an adjusted $323 million in the prior fiscal year, while diluted earnings per share were up 10.5 percent from an adjusted $2.38 in fiscal 2015. For its fiscal 2016 fourth quarter, industrial segment sales dipped 0.7 percent in the to $686.6 million, the company said. Organic sales showed a 1.6 percent improvement, while acquisition growth added 0.5 percent to the picture. Foreign currency translation had a 2.8 percent negative impact on sales. 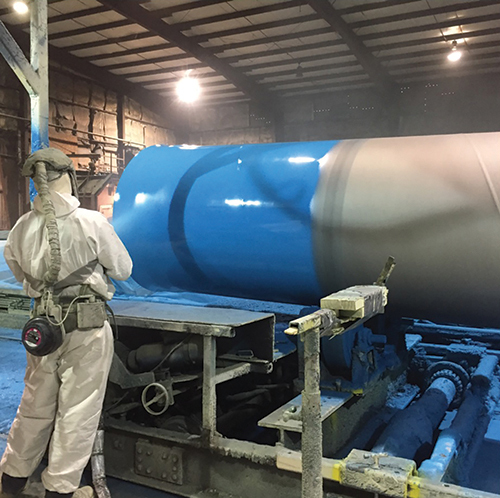 Industrial segment EBIT, up 15.4 percent to $107.9 million from fiscal 2015 Q4, included a one-time gain of $8 million from the revaluation the Carboline subsidiary’s 49 percent ownership in Carboline Dalian Paint Production Co. Ltd. This occurred in conjunction with the acquisition of the remaining 51 percent of the Chinese business on May 18. Excluding this one-time gain, industrial segment EBIT increased approximately 7 percent. "Industrial results included strong performance in the U.S. by our concrete admixture and commercial sealants businesses, which benefited from continued momentum in commercial construction,” Sullivan said. Sullivan noted that many of the company’s other overseas businesses posted improved sales in local currencies, but suffered from currency exchange translation. “We continue to see depressed conditions in the global energy and heavy industrial markets," stated Sullivan. In fiscal 2016, sales in this segment declined 3.5 percent to $2.44 billion. Organic sales increased 2.5 percent, with acquisition growth contributing 0.6 percent. Foreign currency translation delivered a 6.6 percent negative influence. EBIT improved 1.4 percent in the industrial segment to $258.8 million the previous fiscal year. Excluding the one-time Dalian gain of $8.0 million during the fiscal Q4, EBIT would have declined year-over-year by 1.7 percent, the company said. In its fiscal Q4, sales in RPM’s specialty segment grew 5.1 percent to $196.2 million from the same period a year ago. Organic sales showed a 1.7 percent increase, while acquisition growth added 4.2 percent. Sales were negatively impacted by 0.8 percent in foreign currency translation. This segment EBIT jumped 20.1 percent to $32.7 million. “Several smaller acquisitions completed during the year drove the segment’s sales growth into the mid-single-digit range,” Sullivan explained. “We were also pleased with the significant leverage to the bottom line from these predominately U.S. based businesses,” he added. For the full fiscal year, specialty segment sales ballooned 60.1 percent to $732.1 million. Looking ahead to fiscal 2017, Sullivan indicated the company anticipates overall sales growth in the 4-percent to 6-percent range. Organic sales improved 2.7 percent and acquisitions added 60.4 percent, largely as a result of including a full year’s results from the reconsolidation of SPHC companies, which occurred in January 2015, the company explained. Foreign currency translation reduced sales in the segment by 3.0 percent. Specialty segment EBIT was up 64.0 percent to $111.2 million from a year ago. In its fourth quarter, net sales for the consumer segment saw a 9.9 percent jump to $543.8 million from the fiscal 2015 Q4. Organic sales were up 9.9 percent, and acquisition growth added 1.4 percent. Here, too, foreign exchange translation reduced sales by 1.4 percent. Consumer segment EBIT declined 2.6 percent in the fiscal Q4 to $98.0 million. 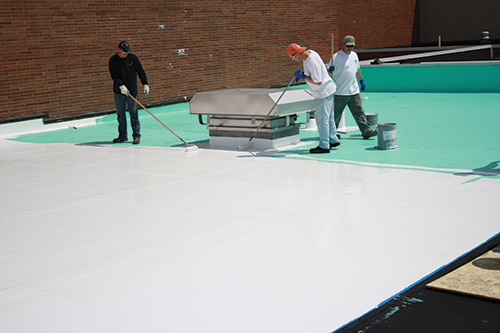 Fiscal 2015 Q4 EBIT benefited from an earn-out reversal of $9.9 million, and fiscal 2016 Q4 EBIT included the impact of a $9.3 million legal settlement related to deck coatings, the company explained. Excluding these two one-time adjustments, consumer segment EBIT saw an 18.2 percent boost quarter over quarter. “Our larger core consumer businesses performed exceptionally well in the quarter, with nearly double-digit growth driven by several product rollouts resulting in market share gains and new product placements early in the 2016 fiscal year,” Sullivan said. In fiscal 2016, consumer segment sales grew 2.1 percent to $1.64 billion from fiscal 2015. Organic sales increased by 3.3 percent, and acquisition growth added 0.9 percent. Currency translation negatively impacted sales by 2.1 percent. Consumer segment EBIT decreased 2.1 percent, to $268.2 million—negatively impacted by the $9.3 million fourth-quarter legal settlement charge and positively impacted by a $14.5 million second-quarter earn-out reversal, the manufacturer noted. Fiscal 2015 EBIT included the benefits of a $9.9 million earn-out reversal during the fourth quarter and a $17 million earn-out reversal in the second quarter. For RPM's fiscal 2016 fourth quarter, industrial segment sales dipped 0.7 percent, those in the specialty segment grew 5.1 percent and net sales for the consumer segment jumped 9.9 percent. Excluding these four one-time adjustments, consumer segment EBIT increased 6.4 percent year over year, RPM clarified. Looking ahead to fiscal 2017, Sullivan indicated the company anticipates overall sales growth in the 4-percent to 6-percent range. It expects to see growth in the mid-single-digit range in the consumer and specialty segments, and in the low-single-digit range for the industrial segment. “We expect continued improvement in the U.S. commercial construction and housing sectors, while global markets will remain somewhat choppy, especially those serving energy and heavy industry, along with currency headwinds, especially the British pound,” Sullivan stated. In regard to diluted earnings per share, Sullivan explained that there were certain one-time items in fiscal 2016 that will not repeat in fiscal 2017, specifically the benefit of the Kirker earn-out reversal in the second quarter ($0.08 per share) and the Dalian gain ($0.06 per share) in the fourth quarter. These were partially offset by a loss of $0.05 per share on the legal settlement charge, also in the fourth quarter, he noted. “Excluding these three items from the full-year fiscal 2016 diluted earnings per share of $2.63, an ‘apples-to-apples’ starting point for fiscal 2017 would be $2.54,” Sullivan explained. “We expect our core business to leverage 4 percent to 6 percent sales growth into 10 percent to 12 percent growth in earnings. However, in fiscal 2017 we anticipate approximately $0.06 per share in additional unfavorable currency translation driven largely by the devaluation of the British pound against the U.S. dollar and $0.05 per share in higher pension costs due to the continued decline in the discount rates,” he said. As a result of these factors, Sullivan says the company’s earnings guidance for fiscal 2017 is $2.68 to $2.78 per diluted share.